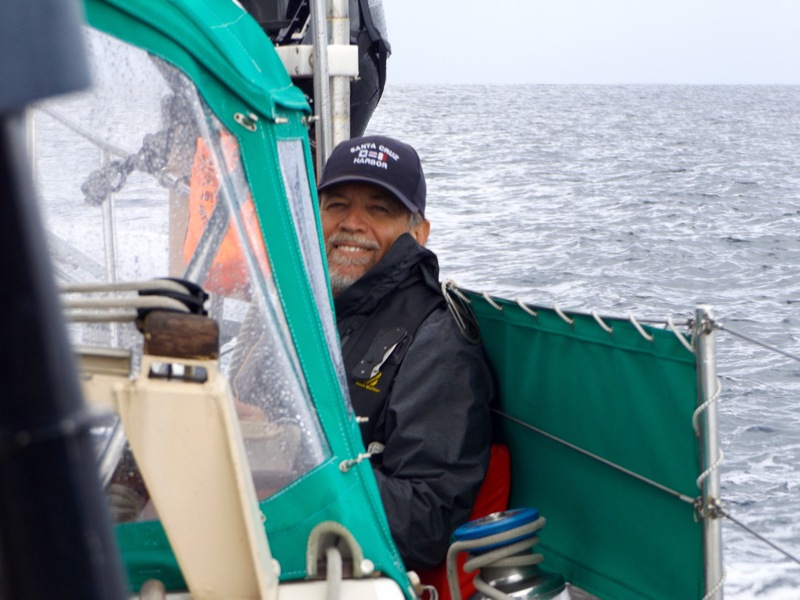 October 4, 2015 departed Channel Islands Harbor @ 11:50 am headed for Prisoners Cove, Santa Cruz Island. Light winds from the NNW no swell to speak of. We pulled out of our slip and headed over to the fuel dock to fill our tanks and our diesel and gasoline gerry cans. As we approached we spotted a Baja Ha-Ha burgee. The first one we have seen on our journey south, which is surprising as 119 boats are headed for San Diego to join the flotilla so we expected to see more. It was exciting for us to meet another Ha-Ha couple and easy to see that they felt the same joy in coming across like minded sea gypsies. Unfortunately, the visit was all too short because they were coming into harbor and we were going out. So we shared some information on discount berthing, along with the lowdown on the free wifi at the coffee shop and the yummy foods to be found at the farmers market, said our “see you in San Diego’s” and off we went. Steve and I were just glad to be free of the dock and we were so looking forward to sailing off to a quiet anchorage. difficult task there comes a reward and boy did we start smiling again. 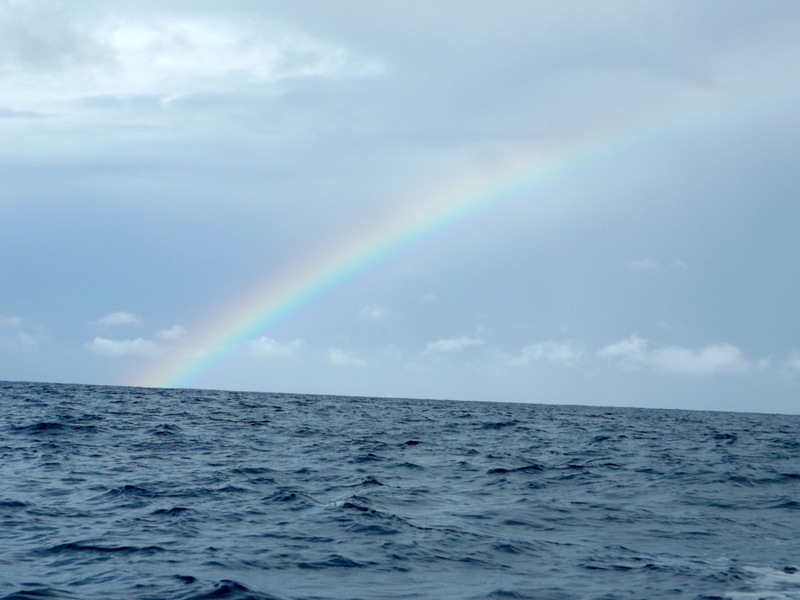 About an hour before coming into our anchorage the rain stopped, a rainbow appeared and we could smell the sage like scent of the freshly washed vegetation of Santa Cruz Island. Only one word……Magnificent! 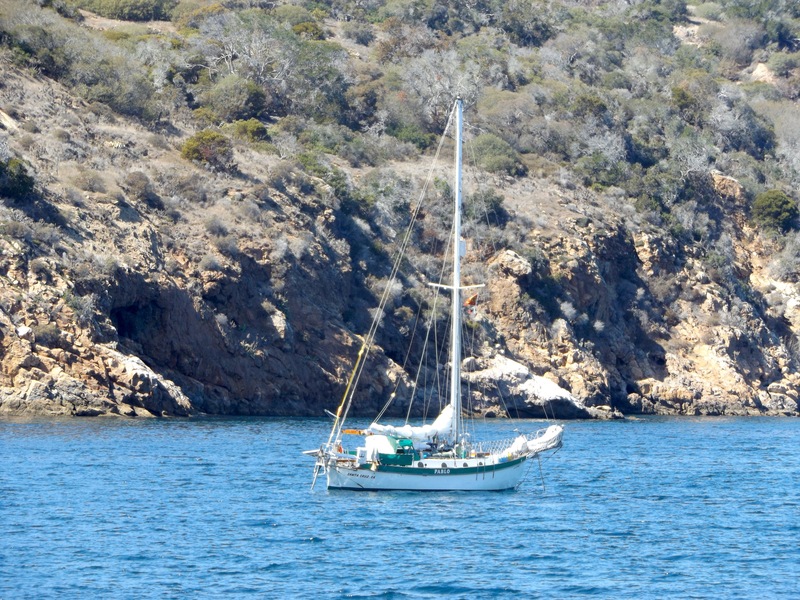 We approached the cove and circled twice, perusing the possible anchoring spots, checking out the three other sail boats, referencing our cruising guide and finally selected the perfect spot to set the hook. We only had one minor problem, our depth sounder went kaput. That’s right. No way to really know how deep the waters below the keel actually are. Without many options for depth sounding, we consulted our chart plotter to at least give us an idea of the waters depth, which in the area we had selected looked to be about 40-50 feet. We slowly let out our carefully marked chain and our anchor set without much problem. We let out some scope and ta-da she’s done! It is our practice to watch our visual land markers for at least an hour after setting the anchor. So we watched as we went about wringing out our clothing, putting on dry socks and preparing our evening meal. Wouldn’t you know it, just as we sat down to eat we realized that we were dragging anchoring and that we were about to become a bit too friendly with our neighbors. So we pulled up the anchor and relocated to a new position and then we did it again, and again and again and again. (THANK YOU Ken Gardner! That electric windlass was a God send). By 9:45pm we were convinced we were stuck to the bottom so we set an anchor alarm and went to bed. Each of us having considerable success at sleep considering the earlier events. Glory of a new day! By morning the world looked bright and wonderful. The sun rose over the island and we ate breakfast surrounded by water, nature, and only a few other humans. Our concern over the lack of real depth soundings nagged at us. We were concerned that we did not really know our scope and the forecast of stronger winds for Tuesday night brought us to the decision that we needed to relocate again. So hoist the anchor and here we go. The depth sounder was still broken so we go old school and make a lead line so we can do our soundings manually. Again we anchored and re-anchored until alas we found good holding in a spot that satisfied our worrisome little hearts. The rest of the day was spent in pure bliss. Reading, napping, and appreciating all that we have and all that we have achieved. 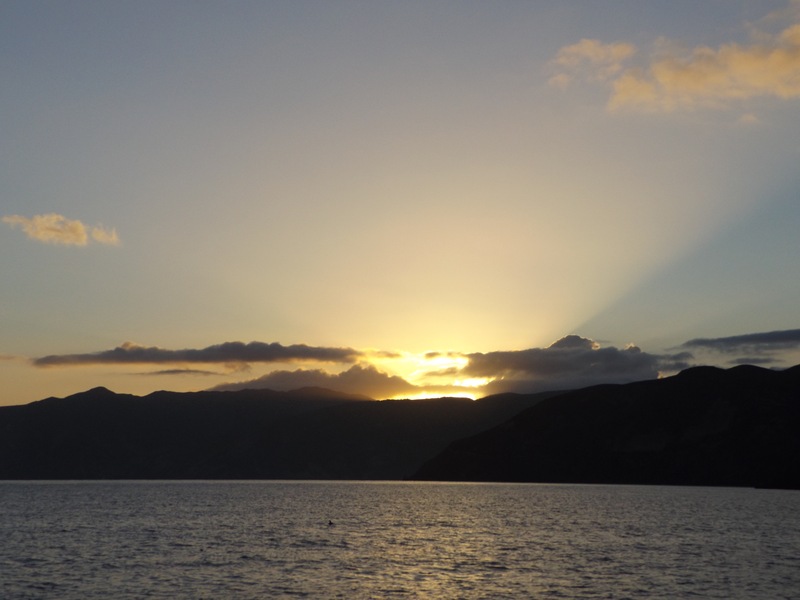 Tomorrow we will assemble the dinghy and go exploring….. if the anchor holds. Mermaid cove. OK I made that up. We approached the folded dinghy with some trepidation as dinghy assembly and launch has not always been easy for us. With our old dinghy we would often look like Laurel and Hardy on the foredeck, spending at least an hour scratching our heads, flipping it this way and that before finally getting it inflated and into the water. Afterwards we usually needed a nap so adventure was soon forgotten. However, we got our new dinghy into the water without much fuss. Yay for us! So we loaded up some snacks, water, our dinghy fixit bag, and off we went exploring. The day was beautiful with blue skies, calm waters and light winds as we scooted in and out of little coves visiting the wildlife, being awed by the beauty of the land and wishing we had snorkel gear. Our journey eventually took us back to the beach at Prisoners harbor. 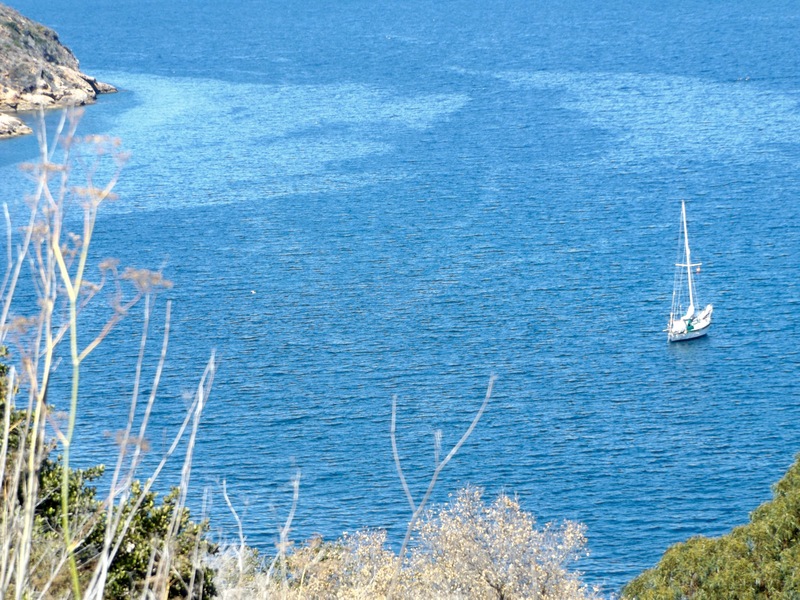 We beached the dinghy and went ashore for a hike to the top of the hill so we could look down on the cove. The view was stunning and I finally got the classic photo of our boat anchored in some remote , serene location. Unfortunately, we had to leave almost as soon as we arrived as the winds were predicted to rise steadily throughout the day and we needed to get ready for a morning departure. 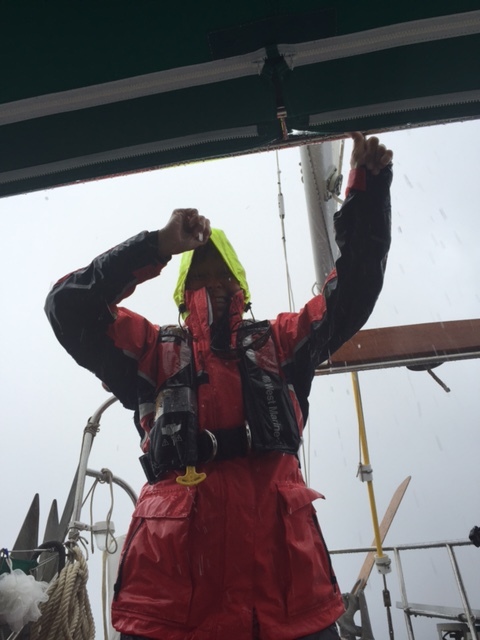 The winds began to increase we motored to the boat. We were feeling a little concerned as we still needed to get the outboard motor hoisted onto the boat, the dinghy back on deck, and everything disassembled and stowed. 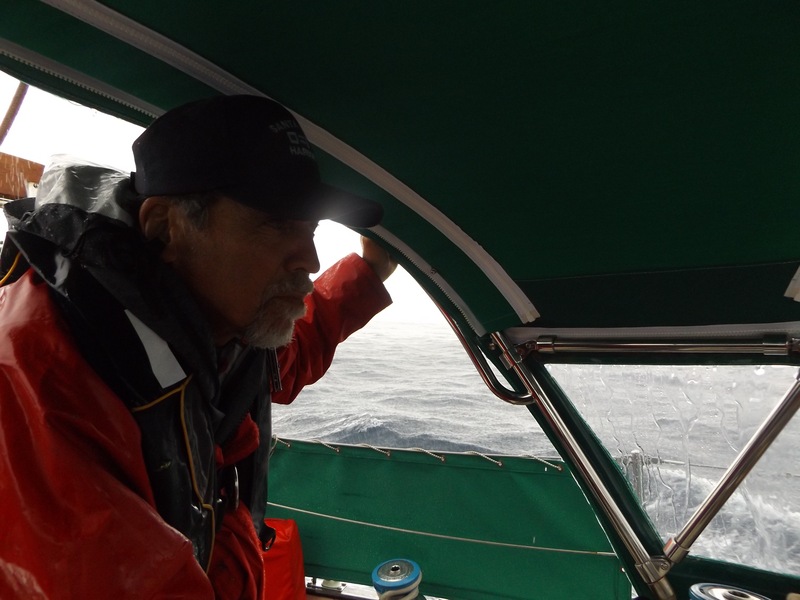 Increasing wind and swell was making the task difficult, but with a bit of effort all this was accomplished much to our satisfaction. Earlier in the day we had visions of a romantic evening with dinner and a sunset in the cockpit, however this was not the case. The wind and swell continued to rise and we rocked and rolled for most of the night. We had purchased a “flopper Stopper” for just such conditions, but by the time we thought about it the night was dark and it was not a good time to be out on deck figuring out how to build and deploy it safely. So we rocked and rolled and rolled and rocked. Somehow, each of us managed to sleep very deeply despite the constant motion. Tomorrow we will leave this lovely place. I think I could stay here and explore these islands for a year or more. What an incredibly lovely place. As for us, we are enjoying the Grand Adventure for all its, highs, lows, beauty and frustrations. We are truly living life to the full extreme. This entry was posted in Uncategorized and tagged Channel Islands, Learning, sailing, Sailing peeps. Bookmark the permalink. I feel as though I’m reading a really good book. You write so beautifully. It makes me feel like I want to be there. Enjoy! Awe. Thank you. Glad you are coming along for the journey. Loving your stories and following your great adventure! Thanks Val. We will be in your hood soon. Maybe we can get together. Thanks my friend. Pictures don’t do it justice. It is simply grand. And Yes, lots of practice. Love, hugs, and blessings! Sounds like you guys are getting lots of practice archoring which is good. Once mastered you can sleep knowing that all is well. Yes, windlass are great! I second Jeff’s comment on your writing…I see a book deal in the future. Enjoy your sail to SD and further south. thanks for all the good tips, Sherri! especially the quick fixit dinghy repair kit, we hadn’t thought of that one and we have an inflatable kayak too. Channel Isl sounds like a place we will hang out for a bit before heading to SD, planning on arriving a week after the BJHH departs. Heard from another cruiser to wait at least a week afterwards. In our dinghy fixit bag is a patch kit, baler, tools for the motor including an emergency starter cord, and our dinghy anchor. 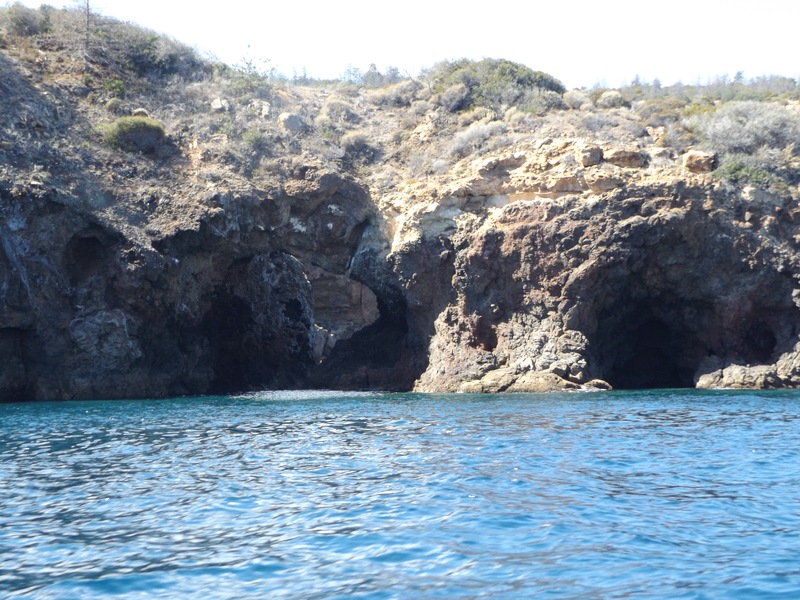 As for the Channel Islands, I could have stayed on Santa Cruz Island for months. If your planning on spending time there I highly recommend the cruising guide by Brian Fagan and Charlie’s Charts. They are both locals and know the best spots. Great descriptions. Your own journey sounds delightful. I look forward to meeting up you in Mexico someday. Safe sailing! Hi Sherri, can you help us with a question on the delorme tracker. We can’t seem to get the URL for the widget, we need a clickable link for our followers. Thanks for your help! 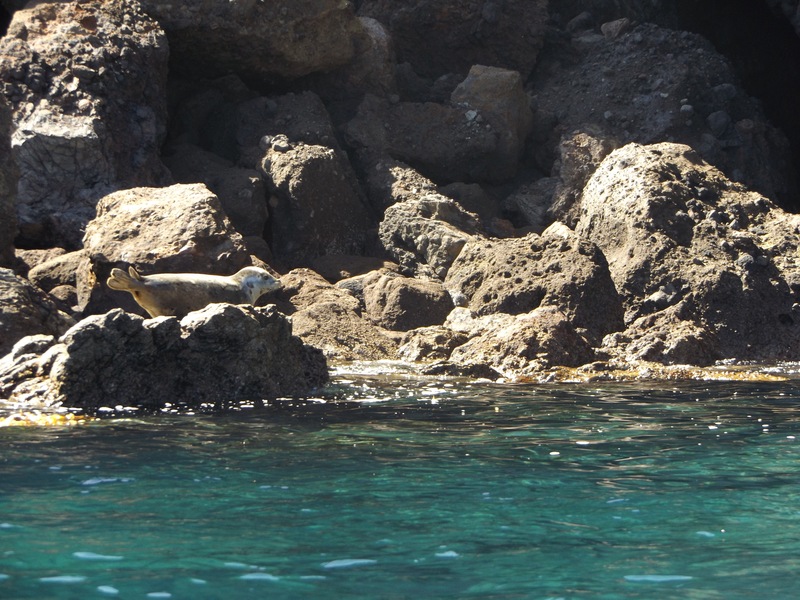 Hope you’re doing well, and we’ll see you somewhere in the Sea of Cortez! Currently in Ensanada waiting to check in on Tuesday. Hello Diane. We have been following your journey. What interesting times you have had. We are now in San Jose Del Cabo and will be heading to the mainland at the end of this week as there is some nasty weather coming shortly. 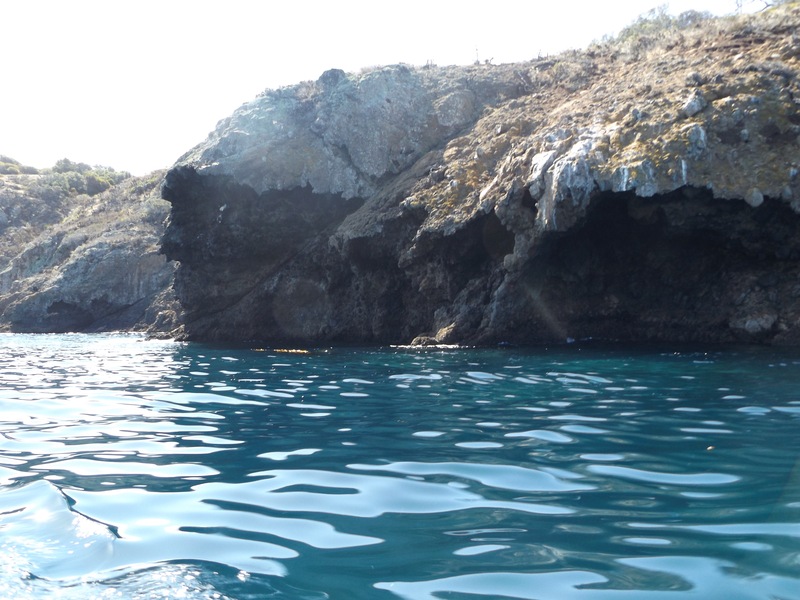 We will mozy our way toward Banderas Bay where we will spend the winter months, arriving in the Sea of Cortez in the spring when she is most beautiful. As for the MapShare tracker, I was not able to get a widget to work on our site so created a “Where’s Pablo” page and attached a link. The instructions are on the DeLorme website. I believe that Sundowner has a widget. You might want to ask them. Safe sailing. look forward to seeing down here. Thanks for your help on the widget, John finally got it working yesterday as a link within a widget. Sometimes I dislike wordpress, it can be frustrating. So happy you guys are moving quickly, it has been a long journey down from Oregon with weather, haulouts, unanticipated repairs. We were so happy to depart San Diego, spent 7 days there doing some last minute legal paperwork for our kids. Anticipating 35 kt winds here in Ensanada tonight, checking in tomorrow and hoping to leave Wednesday for Turtle Bay. We prefer to arrive Cabo SL before end of month. Take care, happy sailing and fair winds! Rita and I are enjoying your journey… Thanks for sharing.